Celebrating the commencement of works at Cartergate. 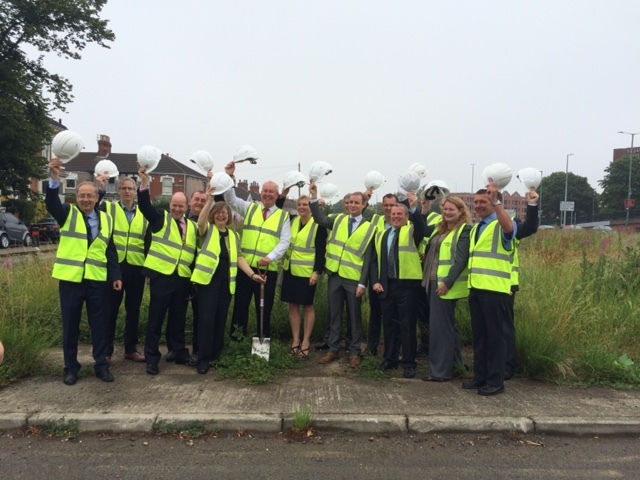 Work to build offices on the derelict Cartergate site in Grimsby has finally got under way. Work started on Monday, August 24, with the construction of a four-storey office building set to be completed by late 2016. The £6 million project will be the new Grimsby headquarters for law firm Wilkin Chapman, who plan to generate more jobs for the area in order to fill the 250 employee capacity building. This project will be the beginning of an exciting journey for all parties and will commence the first contract to be built using Building Information Modelling (BIM) the new Government Construction Strategy. Contracts Manager David Baines will be overseeing Site Manager Alan Smith on this new project.